Soviet Moldavian artist Mikhail Greku (Mikhai Grecu) – Laureate of the State Prize of the USSR (1990), Honored Artist of the Moldavian SSR. Born 22 November 1916 in the village of Faranovka (now Odessa region), Mikhai Grecu studied at the Academy of Fine Arts in Bucharest (1937 – 1940). In 1947 he graduated from the Republican Art College in Kishinev. Greku is the author of paintings, landscapes, and still lifes. First of all, he was one of those artists who was purposefully seeking to enrich the language of modern painting. The sphere of his creative search includes the comprehension of the traditions of folk art, and the development of new principles of poetic narrative and pictorial metaphors. And also the experiments in the field of textural expressiveness (the triptych The History of One Life). 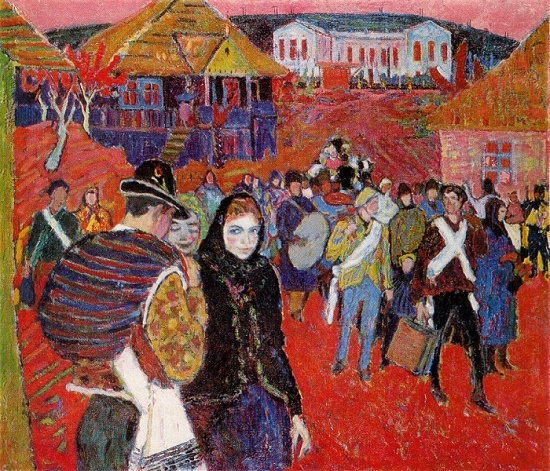 Meanwhile, in the painting “Seeing Off” (1965), the artist turns to his favorite theme – the life of the Moldovan village. The artist shows off the new recruits as a traditional autumn holiday. In the depiction of people, the acute characteristic is combined with the typical, which gives the images both authenticity and poetry at the same time. The artist creates the feeling of the holiday through juicy decorative elegance of the painting itself. Born May 17, 1926 in the old Russian city of Taganrog, Mikhail Ryasnyansky showed his artistic abilities since the early age. Even a 3 year-old boy, in a kindergarten, he was called “artist”. Noteworthy, aged 10, during an art exhibition in Moscow, he received an award – diploma of fist degree, even among adult participants. Mikhail Ryasnyansky participated in the Great Patriotic War – from September 1943 to April 1944. He was an ordinary of 305 infantry regiment of the 108th Guards Rifle Division. However, demobilized in connection with a serious wound and concussion. Awarded the Order of the Patriotic War II degree and medals: “For courage”, and “For victory over Germany”. 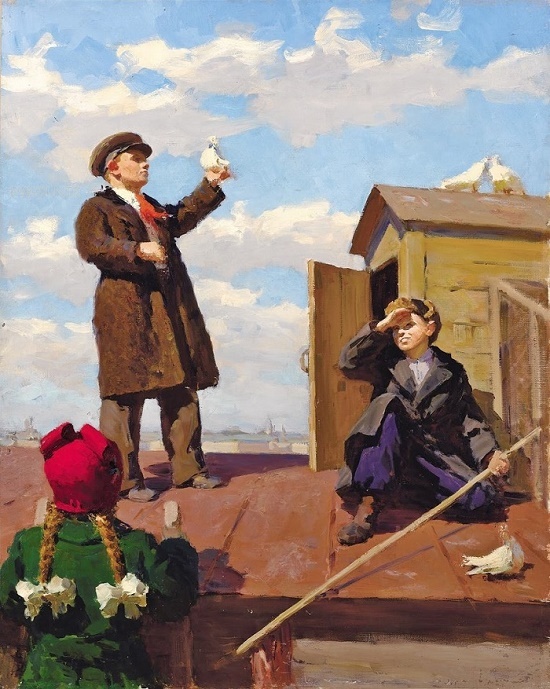 After demobilization, in 1944-1947 he studied at the Rostov Art College of M.B.Grekov. 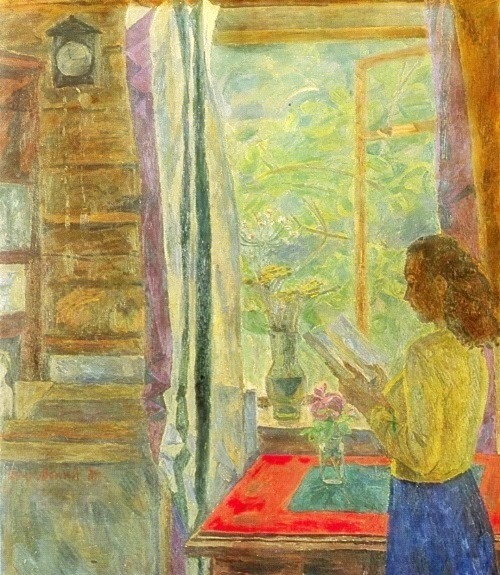 Then, worked in the Rostov branch of the art fund (1948-1950). In addition, he studied at the painting faculty of the Kiev Art Institute, workshops of prominent Soviet artists T. Yablonskaya and S. Grigoriev (1950-1956). Born in the city of Tsaritsyn, Nikolai Yakovlevich Belyaev showed his interest in drawing since childhood. First, he visited the private studio of the artist Durnao. Later, he studied at the Moscow State Academic Art School in memory of 1905 (1936-1940), workshops of PI Petrovichev, SI Frolov, GN Gorelov, and KI Finogenov. 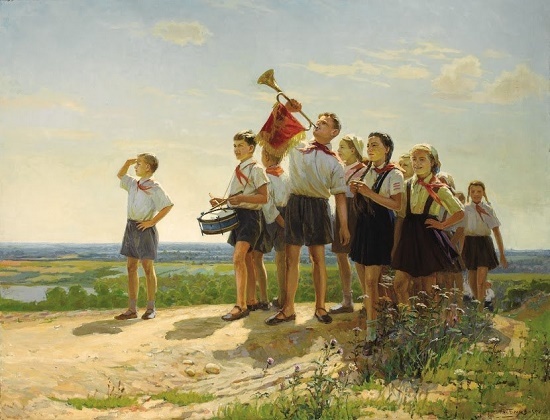 Then, he perfected his education in the Studio of Military Artists of M.B.Grekov (1939-1942). Veteran of WWII, he was the correspondent of the front-line newspaper “Red Warrior” and the magazine Krasnoarmeets (1942). Participated in the fighting in the 16th Army. In 1942, seriously wounded, he lost his left hand. Perseverance and hard work helped him to continue his journey in art. 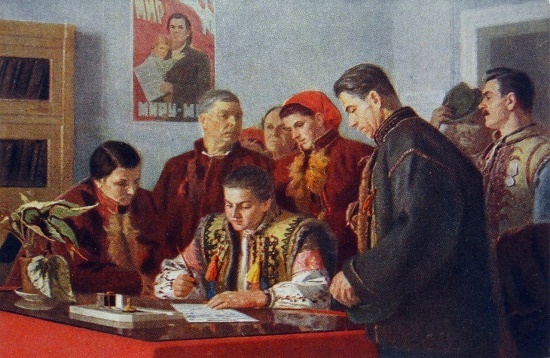 He was awarded with orders: Patriotic War I degree, Labor Red Banner, Friendship of Peoples and medals “For Military Merit”, “For Victory over Germany in the Great Patriotic War”, etc. 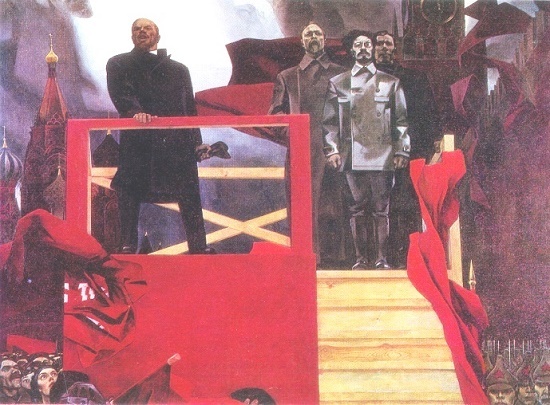 In the painting “Nineteen eighteenth” (1963-1965), the artist managed to create a vivid and effective image of a revolutionary impulse and an entourage. Here everything is filled with high pathetic: the severity and passion of people, piercing contrast of colors, hard, steel rhythm of lines. The concentrated minds generalize the thoughts and feelings of the revolutionary masses. The whole energy of the picture concentrated in the figure of Lenin, the orator, who addresses the crowd with an ardent appeal. Born January 26, 1930, in the village of Kvmenno-Oesrsky of Sverdlovsk region, Mosin always felt himself cultivated by the Urals, its nature and its cultural and historical environment. He inherited from his ancestors, indigenous Uralians, a sense of devotion and love for everything that gave him life and talent. First, Gennady Mosin graduated from the Sverdlovsk Art School. And later, in 1957 he graduated from the Institute of Painting, Sculpture and Architecture of I.E. Repin. Born in 1923 in Tbilisi, Eduard Georgievich Bragovsky graduated from the Moscow State Art Institute of VI Surikov (1953). He studied in the workshop of PI Kotov. Author of genre paintings, landscapes, portraits, and still lifes. Painting by Bragovsky differs spectacular colorful, joyful, and major sound. The richness of color development serves for the artist a bright emotional interpretation of nature. 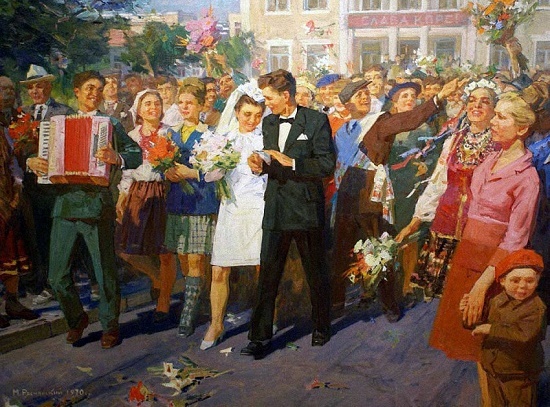 According to the Moscow based artist, he proudly belongs to the “sixties” (1960s). The sixties of the last century, when a young artistic movement was born from the “thaw”, changed the development of Russian fine arts. This movement gave so many fine artists: Pavel Nikonov, Nikolai Andronov, Ivan Sorokin, Viktor Popkov, Tair Salakhov, Albert Papikyan, Peter Ossovsky, Heliya Korzhev, and Mikhail Ivanov … Meanwhile, today this movement in the West is called “Russian impressionism” for some reason.